Tradition reinterpreted for our times. The perpetual calendar with correction-free indication of the date, day of the week, month and moon phase, because of its complexity and mechanical refinement, remains a technical challenge that can be met by only a handful of watchmakers. The mechanism recognizes the different lengths of the months and knows when the next leap year is imminent, and is thus able to counter the arbitrary features of the Gregorian calendar. In the year 46 BC, Sosigenes, the astronomer from Alexandria, developed the basic principles for the calendar we use today. He divided the year into twelve months: with seven months of 31 days, four months of 30 days and one of 29 days, resulting in 365.25 days per year, with one additional day every four years by way of correction. Subsequently, this system became widespread through the entire known world at the time, thanks to the great Roman Emperor Julius Caesar. However, this “Julian” calendar contained an error of 0.0078 days per year. This discrepancy was corrected in 1582 by Pope Gregory XIII. The system, which is named after him misses out a leap year every 100 years, except in complete centuries where the number of years is divisible by 400. The Gregorian calendar is still used today and forms the basis for the way we measure time. Integration of a supreme discipline. The problems that can result with months of different lengths, particularly in leap years, are very familiar to anyone who wears a mechanical watch with a date display. Because normal, simple calendar mechanisms always switch from the 30th to the 31st in months with fewer than 31 days, the date has to be turned manually to the 1st. 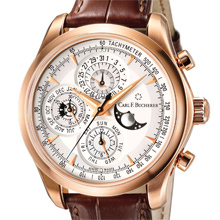 With a perpetual calendar, on the other hand, the movement is able to make these changeovers correctly by itself, with even the leap years being taken into account. Its complexity makes this mechanism one of the supreme disciplines in watchmaking, appropriately referred to as a “grand complication”. No manual correction will be necessary until 2100, when – as in all years that are divisible by 100, but not by 400, – one leap year will be missed out. For all lovers of this traditional masterpiece of the watchmaker’s art, Carl F. Bucherer presents the new Manero ChronoPerpetual. Its capacities are however by no means limited to the perpetual calendar with correction-free display of the date at 12 o’clock, the day of the week at 6 o’clock, the month and leap year at 9 o’clock and the moon phase at 3 o’clock. 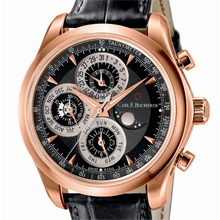 The functional module, which has been specially developed for Carl F. Bucherer, also features a precise chronograph with the popular flyback function. 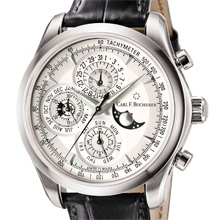 A tachymeter scale completes the range of practical functions so typical for Carl F. Bucherer. A Manufacture movement from Vaucher, with contemporary decoration in the distinctive style of the Lucerne watch brand, forms an exclusive basis. Visual clarity, perfection of form. In spite of this multiplicity of functions and displays, Carl F. Bucherer has also ensured optimum readability of the dial on the Manero ChronoPerpetual. This was a challenge that the designers met by making the design as generous as possible, and by incorporating different levels and surface finishes. The chronograph counters for the hours (6 o’clock) and minutes (9 o’clock) as well as the small running seconds hand (12 o’clock) have been clearly and beautifully integrated into the strikingly recessed calendar displays; fine black lines ensure the necessary delimitation between the displays. A narrow hand from the center indicates the stopped seconds. With the wedge-shaped index marks, the expressive letters and numbers so characteristic for Carl F. Bucherer, and the tapering Superluminova-coated hours and minutes-hands, the traditional complication of the perpetual calendar has been reinterpreted for our times. The chronograph hands are in a discreet black or white. The center of the classical silver-colored or black dial is matt, while the chronograph counters and the minute division ring are brushed, creating an attractive play of light. The moon phase indication also has a contemporary design, with an anthracite-colored background and a silver-colored moon disk. This timeless presentation is expertly continued in the fine rose gold or modern stainless steel case. The case has been subtly reworked for the Manero ChronoPerpetual: satin finish and polished elements are excitingly contrasted, the lugs are more angular than in earlier models, the bezel has a concave shape while the sapphire crystal is domed, the crown and the polished chronograph push-pieces are elegantly simple. The case back with integrated sapphire crystal permits a clear view of the mechanical jewel with its 22 crat rose gold oscillating weight. Last but not least, the exclusivity of the Manero ChronoPerpetual is enhanced by its strictly limited edition: 150 pieces have been manufactured in stainless steel, while the two rose gold versions are limited worldwide to just 100 pieces each. With this new model from the Manero collection, Carl F. Bucherer has succeeded in creating a watch that will delight all connoisseurs who value the masterly achievements of the traditional art of watchmaking, combined with maximum functionality, in a timeless and yet contemporary exterior.